Simplicity, comfort and solid construction. A contemporary, elegant and functional design. 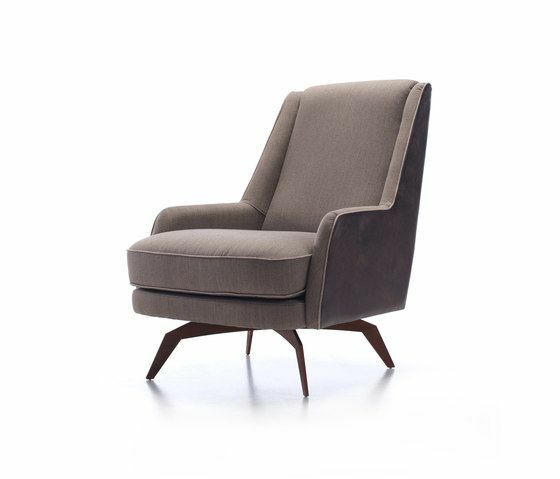 Qualities giving this chair a timeless character. Shapes allowing combinations of fabrics: more rigid and tough on the outside, softer and warm on the inside. Different finishes of the swivel base, from wood to steel cut, remarks the quality of Blom to adapt to any need. MATERIALS 1. Solid wood frame covered with HR 30 kg/m3 foam. Suspension made with NEA elastic webbing with 10 year guarantee. 2. Seat made with HR 35 kg/m3 foam with silicone fibre cover. Removable cover. 3. Base in different options of swivel base to choose: steel cut, metal painted in epoxy or sycamore solid wood. Also available with fix base in beech solid wood feet.